AWS is the most popular cloud service provider at the moment and a lot of our customers have their videos stored in their S3 bucket. Their usual method of import was to generate temporary download URL and using them to import videos. This usually involved a bit of programming to AWS S3 API. With this new feature, we plan to make import videos from S3 to VdoCipher process a lot easier. You need to create a new IAM user in your AWS account with the permission to do action ListObjects and GetObjects in the desired bucket. AWS IAM console will give you the aws_access_key_id and aws_secret_key. 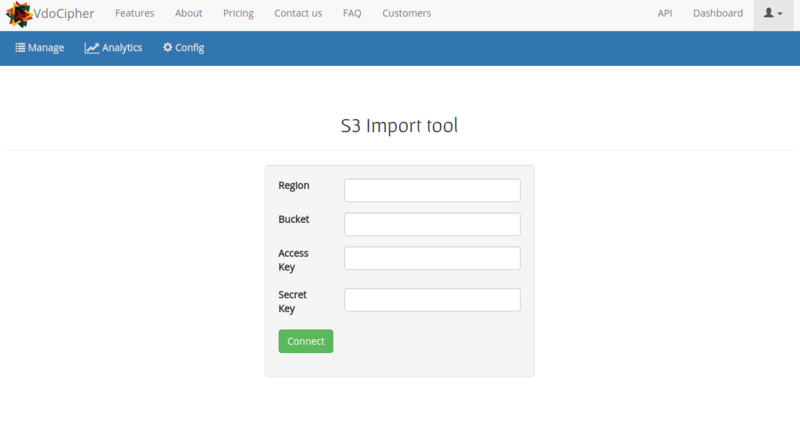 In your VdoCipher dashboard, click on import and chose the option to “import from S3”. You can enter the region, bucket, key_id, and secret_key. Upon connecting, you will see a list of your root objects and you can navigate around like a regular file browser. On clicking the import button, our backend will create temporary download URL for the video object and add it to your list of videos. You will be able to see the video id and current status. Once you have the videos imported, you can go back to the dashboard to set correct title, description, and tags for the video. Adding tags is recommended because it helps to sort and manage your videos. The files should now be processing. Give the video some time to process. Once their status is ready, you can embed it in your website or mobile app. AWS recommends creating a new IAM user for every purpose. In this case, you should create a new user with permission to ListBucket and GetObject. Here is a sample policy file that you can use for this purpose. Replace the NAME_OF_BUCKET with the real name of your bucket.